In just 4 months, we increased conversions by 220%, Revenue by 300% and Profits by 3000% for an eCommerce company called Century Hearing Aids. 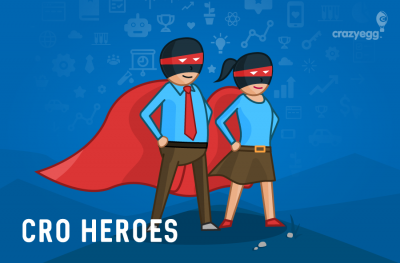 We want to share with you the 4 types of changes that were most productive from our conversion optimization testing. great reviews and great prices. So why were sales and profits declining? If you bid on competitive keywords, you know how hard it is to stay profitable when sales dip. 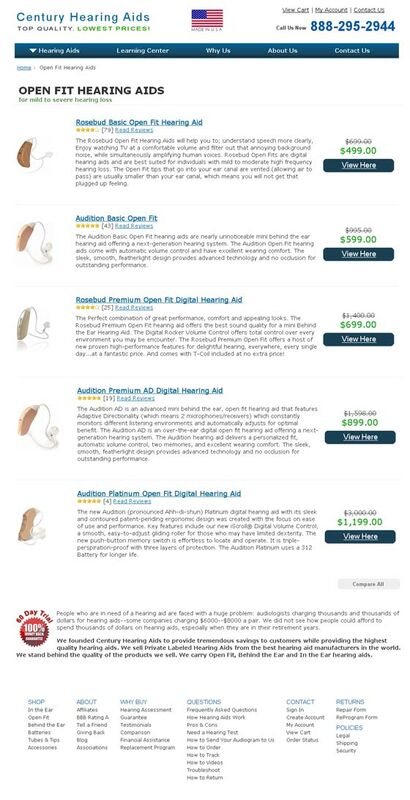 The hearing aid market is competitive and Century Hearing Aids needed to bid on a lot of expensive keywords to generate good revenue. When their conversion rates began to suffer, they had to pull back their advertising. Jon Stoddard, the owner of Century Hearing Aids, asked if we could help with his conversion rates. We needed to increase their conversion rates so more of their visitors converted into paying customers. This would allow them to be more competitive with their PPC campaigns instead of scaling back. And they needed it fast. We had to rely on our experience, instinct, creativity, and analysis of limited data to get things started. And this is one of the first mock-ups that we put up for the main page. We made many small changes, but let’s focus on the 4 categories of changes that were most productive. Let’s get into the details of each of these change categories. This first image is what the site looked like when we got started. We needed to communicate a number of things to establish trust with site visitors, but we did not want to add a lot to the page to clutter it. So we did the following to tell the visitor more with less. Minimal Design – We cleaned up the overall design. A clean, simple design does a lot to earn a visitor’s trust. Part of simplifying the main page was removing the subscription form for the free report. We want to focus the main page on filtering visitors to the products they are interested in. Jon (owner) was advised by other internet marketers to be aggressive at building a mailing list, but there must be a balance. Building a list should not interfere with selling a product. Selling a product is the main goal of a site like this. Image above the fold – We added a header image that depicted an elderly man happily spending time with his family. What is better than being able to hear your family again? A little human touch usually works well. This helps us accomplish more with less. Images are really worth a thousand words. Enhancing reviews – We wanted to show more than the product review stars. We wanted to show the number of reviews since because the number is impressive and generates trust through social proof. This instantly shows that the site has regular customers, it adds to the trust and it is a powerful link because people love to read customer reviews. The more customer reviews, the better. 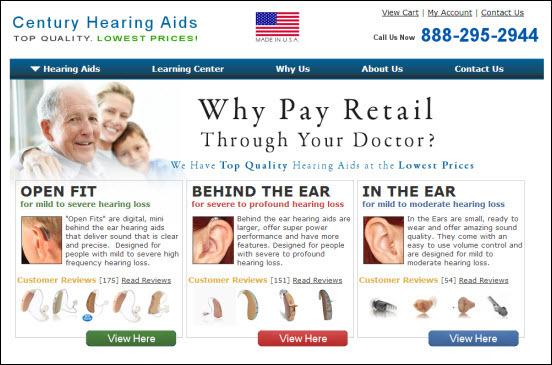 The business owner had removed “in-the-ear” hearing aids due to low profit margins. This was causing a serious conversion problem. 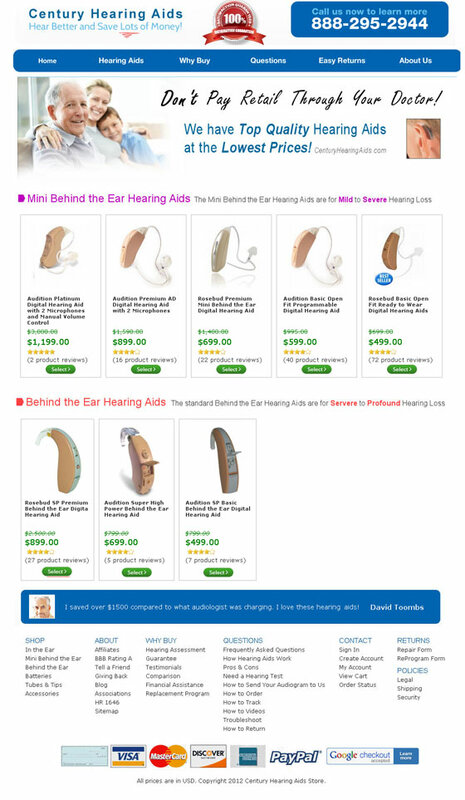 In his PPC campaign, he was bidding on numerous keywords such as “digital hearing aids” that were leading traffic to his site that was searching for “in the ear” hearing aids. In fact, this product represented over 50% of the market. After realizing that this could really be hurting sales and he was missing out on additional profits, we suggested he put them back up for sale. This was a simple change that made an enormous impact on revenue and profits. It is very important that you do not miss out on converting a large percentage of your visitors due to not having a product that they might be looking for when coming to your site. The same for services. If you can easily offer a service that you think many of your visitors are interested in, then offer that service. We discovered a possible issue with the keywords they were bidding on. 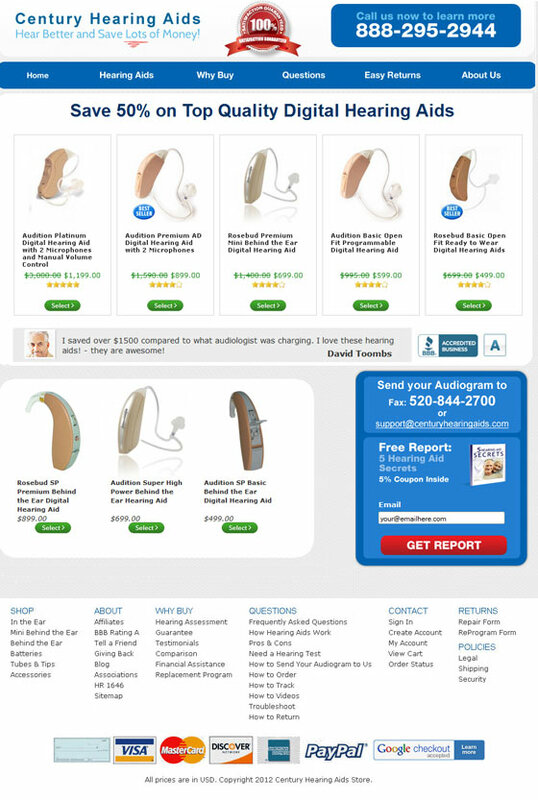 These keywords did not seem like keywords used by people who are ready to buy hearing aids online. Which of the keywords below should this client be bidding on? I am a bottom-line guy. I want to see sales and profits. I can care less about click through rates and “performance” of ads. If ads are not generating sales, they are not performing in my eyes. Plain and simple. I broke down each keyword and checked the sales and conversion rates. Several of the largest campaigns were losing a ton of money while the most profitable campaigns were not taken advantage of. After I showed this to Jon, he let us change the campaigns. We were able to generate more PPC traffic while also increasing the conversion rates from that traffic. Sometimes you can have a great site, but if you aren’t driving buyers to it, conversions will be low. 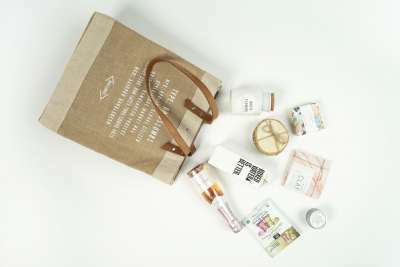 We moved the products off the main page. We wanted to filter the visitors from the home page to product category pages instead of listing all of the products on the main page. The category pages could then do a much better job at explaining/comparing the products on the same page. This way visitors did not have to guess which product they were interested in from the main page. One of the concerns with doing this was adding an extra step to the checkout. We checked the data after a couple weeks and the checkout page visits were very low. We knew this might happen and even though sales still were doing great, we were not satisfied. We analyzed the visitor flow to see which part of the site people were dropping off. The main page and product pages were doing well. Most of the visitors were clicking through to other pages. The category pages were the issue. A large percentage of people were dropping off of the category pages. Visitors coming from the main page to a page that compared the features of the products was not a good idea. We developed the following page to give visitors a general description of the products so they could make an easier choice between them. We made a lot of small changes, but those 4 types of changes were the most productive. Every site is a little different. Your site might need different types of changes. In this case, concentrating on generating trust, optimizing the traffic source, offering what the visitor was looking for and adjusting the visitor flow were very important for converting visitors into customers. Do you feel like this case study can help your business? Please let us know in the comments.